California Poppy Orange Eschscholzia Californica is a short-lived perennial that belongs to Papaveraceae family. 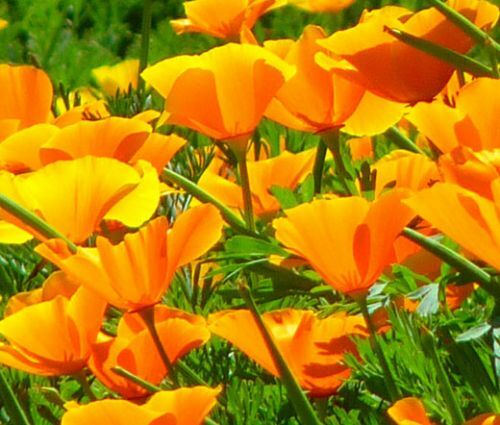 California Poppy Orange bulk seeds can be started directly outdoors in spring. Eschscholzia Californica forms branching mounds of finely divided, fern-like, blue-green foliage with long floral stems and produces single, cup-shaped, silky, bright-orange flowers. Orange California Poppy blooms from late spring to early summer attracting bees and butterflies. California Poppy Orange looks fabulous in mass plantings, alpine and rock gardens, flower beds, borders, pot and containers. Eschscholzia Californica bulk seeds germinate approximately in two weeks, and once established, California Poppy is very drought and heat tolerant that makes this plant perfect for planting in sandy, dry locations with good drainage. California Poppy Orange is a great cut flower.